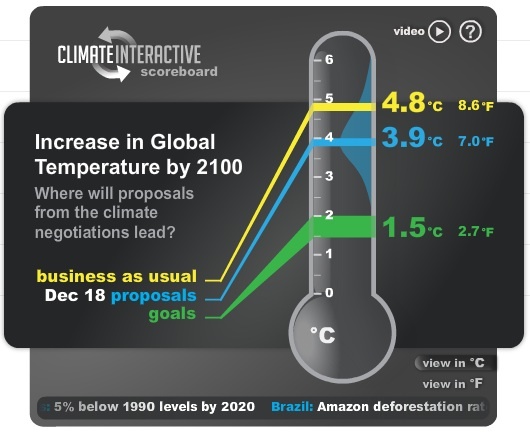 The Climate Scoreboard, created by the Climate Interactive team with the C-ROADS simulator, indicates long-term outcomes of national proposals. It does not yet reflect the content of a yet-to-be-finalized Copenhagen UNFCCC agreement. Determining whether or not the “deal” in Copenhagen is a success is a difficult task. We at Climate Interactive have noticed confusion, including mischaracterization of analysis of preexisting national commitments as an analysis of a proposed Copenhagen accord. We offer the following as a framework for thinking about the outcome of COP15. We feel it is important to distinguish the outcome of Copenhagen in two dimensions: National vs. International (UNFCCC) targets, and 2020 vs. 2050/2100 ambition. National vs. International Commitments: Many countries have passed or pledged domestic actions to reduce emissions. These can be evaluated to see whether or not they are sufficient to achieve particular goals (e.g., climatescoreboard.org). An agreement in Copenhagen may include aspirational goals — goals that nations agree on but for which domestic actions and international enabling or enforcement measures might not be specified. If this is the case, then it is important to note the climate implications for the international targets, while also realizing more work needs to be done to realize them. 2020 vs. 2050/2100 Evaluation: Many reports indicate a target emissions level (in gigatons CO2eq) that is desirable for 2020, in order to provide a reasonable chance of achieving later goals. While 2020 emissions don’t strongly determine the future by themselves, they set the stage for what is possible with continued reductions in the future. Alternatively, pledges can be evaluated against long-term climate metrics, such as concentrations (ppm) and temperature change (e.g., 2 deg C) in 2100. Within this framework, the Climate Scoreboard indicates long-term outcomes of national commitments. It does not yet reflect the content of a yet-to-be-finalized Copenhagen UNFCCC agreement.